With assistance from the Eurasier Society of UK and the Eurasier Club of Belgium, Bjordi was chosen to be the sire. We are very grateful to his owners Greetja and Serge for their hospitality during our time in Belgium. With assistance from Michelle of Chaospitz Eurasiers and the Eurasier Society of UK Revel - Chaospitz No Regrets was chosen to be the sire. We are a small family breeder based in Lincolnshire. The health and wellbeing of our Eurasiers is most important to us. 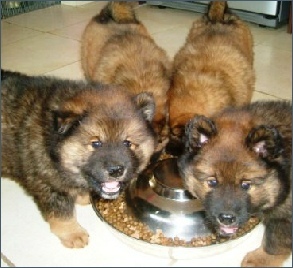 We are members of the Kennel Club Assured Breeder Scheme and as part of the Eurasier Society UK we sign-up to their very strict Code of Ethics. We are dedicated to ensuring a bright future for the breed in the UK. We take great care in breeding our dogs and spend a lot of time and effort in finding the right stud and in raising our litter. Do expect us to ask you lots of questions if you enquire about one of our puppies. It is very important to us that our puppies go to good, forever homes and that the puppy you receive is right for you. Maisie gave birth to three boys and one girl. Once again we would like to thank Eurasier Society of UK for helping us to find the best boy for Maisie and also to thank Caroline and Liam, Bismarck’s owners.